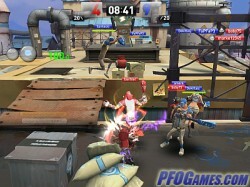 Brawl Busters is a fast-paced action MMO. Choose from five classes and jump into either single or multiplayer action. Brawl Busters features cartoony, vividly colored graphics and four game modes, including classic team deathmatch, free for all, and zombie survival. The combat is fast-paced and features both melee and ranged combatants. It’s easy to notice the game’s striking visual similarity to Team Fortress 2, but Brawl Busters is really different in terms of gameplay and classes, featuring picturesque maps and comic player models with weapons ranging from baseballs to boxing gloves and guitars. Servers are plentiful and always populated, making it convenient to escape for a 20 minute session of Brawl Busters during a break. The game is fun, works on older computers, and, altogether, the only complaint is the store bonuses which do favor players who pay up — but not too much.